Narration opens the issue–we don’t know who it is, initially–telling us of Barry and having been inspired by him. Then Barry’s woken up in the forensics lab, but finds himself confused by the world around him–something’s not right. Racing out, he finds the ring with his costume is missing…a surprise that sends him tripping down a flight of stairs to meet his mom. The scene shifts to Batman in Gotham has he hunts information on the Joker, and is confronted by Cyborg. Cyborg and the heroic community need Batman’s help. Following plenty of exposition to ideally psyche one up for the 15+ mini-series and specials attached to this event, we find Barry later entering the Batcave from an un-tended-to Wayne Manor, to voice the “big shock” of this issue and set some of the tone for what’s to come. I can’t argue with the art on this issue–Kubert does a great job with things. I really like the look of all the characters…even though I’m not familiar with all of them, a great deal of them are quite familiar, and I really don’t have any problem at all with the depiction of the ones I’m sure of. The story itself isn’t bad. The initially-unknown narrator is sort of cliche and I found myself trying to figure out if it was Barry or Wally, which took a way a bit from the opening of the story. I found that from the point of view of Barry–waking into an unknown world, I was on decent footing as far as knowing who the various characters are. There is PLENTY of context and exposition to bring anyone new up to speed on the essentials–I haven’t touched most DC books in nearly a year, and followed along just fine overall. Brand-new-to-comics readers might still be put off a bit, but if one has a decent familiarity with the overall landscape of the DC universe, this wouldn’t be a bad issue to jump in on, in and of itself. Johns continues to show a strong handle on the DC characters, and for introducing Big Things. 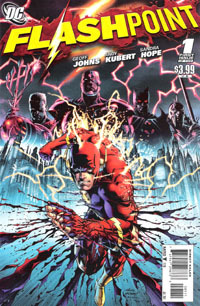 Where my feelings on the issue go downhill is at the fact that much of the exposition and characters in this issue seem to–combined with the knowledge there are over 20 Flashpoint issues next month–reek of simply setting stuff up and then tossing one at all these tie-in comics for the real meat of the story, to flesh out the world Barry’s found himself in. Structurally it makes sense for the “event,” but as a reader who had absolutely zero intention of picking this issue up this morning and gave in to buy only the first issue to have a look-see…it’s a bit of a putoff. 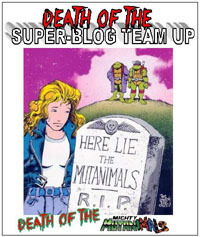 I have little doubt that the core 5-issue mini will have a full story to it without the tie-ins, I fear that it simply will not have anywhere near the full story, nor even enough of the story to justify buying on its own. The series seems to be another $3.99 thing…probably because it’s the tentpole title on the event and may have extra pages (I don’t honestly care enough to count them…the price is what it is). The hype machine worked enough to get me to buy this issue, and if I were game for leaping into another full-sized event, I think this would be a very good start to it and have me looking forward to what’s coming. However, event fatigue remains, and so I feel rather cool on the whole about this issue. In and of itself: strong issue. In the greater context, if you’re not planning to buy a bunch of (or all of) the tie-ins and such…I’d recommend searching out the “big spoiler” online, and wait for the inevitable collected volumes.